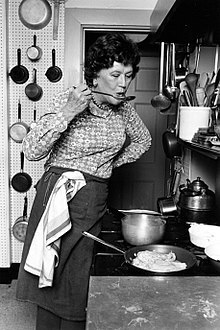 Julia Carolyn Child (née McWilliams; 15 August 1912 – 12 August 2004) wis an American chef, author an televeesion personality. She is recognised for bringin French cuisine tae the American public wi her debut cuikbeuk, Mastering the Art of French Cooking, an her subsequent televeesion programs, the maist notable o that wis The French Chef, that premiered in 1963. ↑ Michael Rosen (interviewer) (June 25, 1999). Julia Child – Archive Interview, part 1 of 6 (video). Archive of American Television. Archived frae the oreeginal on 2010-04-08. Retrieved 2013-05-24. This page wis last eeditit on 7 September 2018, at 05:43.